The use of sodium chloride (NaCl) or common salt as fertilizer is a practical means of increasing coconut production. Salt is the cheapest and best source of chlorine to increase copra yield (Table 1). Chlorine deficiency in coconut is widespread in inland areas. 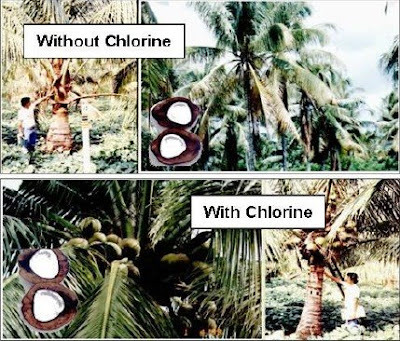 A PCA survey conducted nationwide showed that at least 40 coconut-producing provinces are severely chlorine deficient. From 1991 to 1997 farmers in the Philippines had fertilized more than 170,000 ha of coconut (approximately 18 M trees) with salt. This had resulted in an average relative yield increase of 125% over unfertilized coconuts. Recently, it was considered in Indonesia to be a general and ideal fertilizer for coconut (applied in about 2 M ha). Holing (for hilly-sloping areas distributed in 8-10 inches with 3-5 inches depth around the base of the tree). In broadcast application, the fertilizer is placed uniformly over a weeded area around the base of the palm (1 m radius depending on the age of the palm). At nursery stage (6-8 months), seedlings are applied with 60-70 g NaCl per seedling (the first half at the start of the rainy season and the rest, 6 months after or before the end of the rainy season; split application). This increases the plant’s girth and fresh weight, indicating that chlorine nutrition is a positive factor in improving normal conditions of the seedlings in the nursery. Generally, bearing palms are fertilized annually in areas with almost uniform rainfall distribution (Table 2). In areas with distinct wet and dry seasons with uneven rainfall distribution, and those with sandy soils, fertilizers are best applied every six months. In a long-term study of salt application, 1.5 kg NaCl/tree/year is considered to be most effective and economical to increase copra weight/nut and copra yield (per tree or per hectare). Split application is done at the pre-bearing stage (one to four years) of palms. This practice helps reduce loss of fertilizer nutrients through leaching and run-off and make fertilizer use more effective. Net profits from coconut farming depend much on the fertilizer cost, yield, and copra price. The use of salt as fertilizer at a rate of 1-2 kg salt/tree is estimated to give the added benefits of P10,000 – P19,000 (Table 3) per ha per year at P12/kg copra. The importance of this technology should not be overlooked, much less ignored. To maximize output and obtain optimum returns, the coconut tree must be cared for, freed from diseases and fertilized. Amount of salt: 2 kgs. per tree/year (3 years application). Make a circular canal/trench (with a radius of 1 meter from trunk base) of 3 inches deep. Spread the salt evenly in the circular canal and cover with soil. In sloping or hilly areas, dig 10 equidistant holes around the trunk base. Place salt in holes and cover with soil. yes , It really works. How much salt do we have to put for a 22 years old coconut tree. is it also applicable for thirty year old coconut trees? Can fertilizer be mixed with the salt application too, if so what will be the right mixing proportions? Also do we have the chemical hormone to attract/fight the rhino beetle available? Thank You, your efforts for the coconut industry are well appreciated and commendable, God Bless and more power!